One type of monster that has become commonly reported since 1947 are creatures believed to be either travelers from outer space, or visitors from another universe entirely. These creatures are collectively known as “aliens”, and are believed to fly strange airships that are seen as unexplained lights and objects in the skies of the world. So many different types of aliens have been reported that it seems impossible for them to all be of the same origin. In the United States, the most commonly reported type of alien monster since the late 1970’s have been nicknamed “The Grays." This name is due to the description of these humanoid creatures as having gray skin... as well as skinny bodies, abnormally large heads with big, black, pupilless eyes, no ears, no hair, and just a slit of a mouth. Sometimes they are as small as children, and sometimes eight feet tall... but always skinny. It is unclear whether or not these creatures wear clothes; some people feel they are naked, while others assert their strange appearance is because they are wearing protective spacesuits. Grays are said to do strange ― sometimes terrible ― things to people. They are able to paralyze humans and render them unconscious without touching them. Even small Grays seem to be able to move humans with very little effort, as if they were far stronger than their skinny frames would suggest. The Grays appear to be very curious about humans in general... they have been seen to examine the objects in bedrooms, watched by frozen witnesses from their beds. 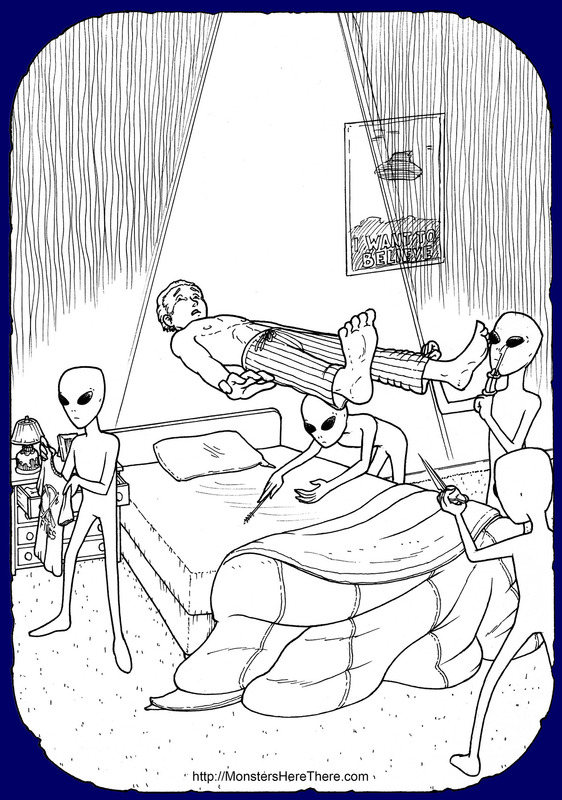 On December 26th, 1985, popular author Whitley Strieber claimed he was in his cabin near Kingston, New York, in the United States, when he heard noises downstairs like a number of people moving; for some unknown reason, he just went back to sleep. Over the next few days he was bothered by strange pains, such as a persistent headache and a painful line on his right index finger; but he was also bothered by weird partial memories that seemed to be related to these pains. Strieber went to a hypnotist to try to recover these memories. Under hypnosis, he recalled being carried out of his cabin to a spaceship above the woods. In the ship he saw aliens, including a Gray. They performed a number of medical procedures on him, such as sticking a needle into his brain and cutting his index finger open. When done, they placed Strieber back in his cabin and left. This is just one account of what is now called “Alien Abduction.” Some researchers believe these abductions are an ongoing, but hidden, experience for many people worldwide. The Grays seem to abduct the same people repeatedly, removing their memories of the events afterwards. Using hypnotism to recover their memories, the abducted people describe Grays as communicating directly with their minds and being very detached from their actions, as if they were simply doing a job with no idea of the possible damage their captives might suffer. Many skeptics, however, feel that these “recovered memories” are questionable because hypnotized people are very easy to mislead into having a false memory they will feel is real... but, physical evidence of the Grays may exist separately from the questionably recovered memories. On July 8, 1947, something unusual crashed in New Mexico in the United States. The site of the crash was taken over by US military forces, and quickly cleaned up... reportedly, the debris was taken to the military base in the town of Roswell, before being shipped off to a more secure place. Many people now believe that the crashed object was an alien spaceship, and that this fact was covered up to prevent a panic. The crew of this alien vessel are said to have been found dead among the wreckage; their bodies ― described as Grays by the witnesses who later spoke about the incident ― are believed to have been taken to a secret government base for examination. If true, then direct evidence for the existence of the Grays may exist somewhere in the United States of America. This would be an absolutely amazing event... except there may be a big problem with this story. While the Grays are now the most commonly reported aliens encountered in the United States, there was a time when they were just another odd-looking being that someone claimed to see in a spaceship. In fact, people have been claiming to encounter a variety of aliens since the 1940’s... but by the end of the 1970’s, almost every American who reported encountering an alien described the being as a Gray. This change seems to be linked to the release in 1977 of the movie called Close Encounters of the Third Kind. This movie is about a meeting of humans with aliens from another world... and the aliens in the movie look like Grays. Because the movie was very popular, Grays became the aliens of choice for new fictional books, movies, and shows. Shortly after the release of the movie, Grays became what most Americans who encountered aliens described meeting; and even the Roswell story above appears to have been effected. The initial story of the Roswell incident, reported in newspapers in 1947, did not include alien bodies. But in 1978, a researcher interviewed the still-living witnesses to the event... and this is when it was claimedthat Gray alien bodies had been found. Because of this timing, skeptics claim that these new details were made up using a description of the Grays from Close Encounters of the Third Kind! Of course, it shouldn’t be forgotten that the aliens in Close Encounters of the Third Kind were originally designed to look like the Grays that had been reported before the creation of the movie. This points to an interesting idea; that possibly the appearance of aliens depends mostly on what people expect to see. So maybe the aliens are all just in the minds of people who think they meet them; or maybe ― just maybe ― real aliens from somewhere else change in appearance to match what humans expect them to look like. Close Encounters of the Third Kind [movie] written & directed by Stephen Spielberg, 1977 Columbia Pictures. Online at Wikipedia: Click Here! & Original movie trailer at YouTube: Click Here! Communion: A True Story, by Whitley Strieber, 2008 Harper Paperbacks. ISBN-10: 0061474185. Online [preview of book]: Click Here! The Field Guide to Extraterrestrials, by Patrick Huyghe, 1996 Avon Books, USA. ISBN-10: 038078128X, ISBN-13: 978-0380781287. The Little Giant Encyclopedia of UFOs, by Jenny Randles, 2000 Sterling Publishing Company, Inc., Toronto, Canada. ISBN: 0-8069-1891-8. The Roswell Incident, by Charles Berlitz & William L. Moore, 1980 Gosset & Dunlap, USA. ISBN: 0-448-21199-8. Secret Life: Firsthand Documented Accounts of UFO Abductions, by David M. Jacobs, 1993 Fireside, New York, USA. ISBN: 0-671-79720-4. Online [preview of book]: Click Here!